Some of these stories are truly amazing, and this was just the sort of thing that I wanted to read about now and jump around from topic to topic. Grann is a staff writer for the New Yorker (and has written for numerous other lit bigwigs), and I would bet that these essays first saw the light of day in that publication – they are lengthy, well written and good examples of creative non-fiction (or narrative journalism, if you’d rather). I think this book must have taken quite a while to compile enough material for the whole manuscript as each essay involved a lot of time and travel to interview the involved parties and all their backgrounds and write all the info into one coherent whole. It’s also interesting to me that Grann doesn’t always have an answer – some of these mysteries remain just that at the end, so this definitely kept me wondering once I had finished each essay. 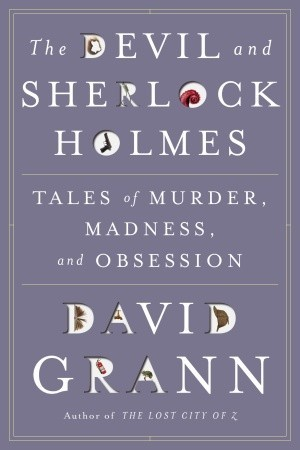 As mentioned, there are about 12 essays in this book, and topics are all over the place, from the possibility of the number one Sherlock Holmes fan/scholar being murdered for knowing too much to the history of the Aryan Brotherhood in US prisons. This must have been fascinating to write from Grann’s perspective (as it was from my reading perspective) and I would have loved to be in some of those interviews with him. “Fly on the wall” type of thing. For another good read from David Grann, try “Killers of the Flower Moon: The Osage Murders and the Birth of the FBI” (2016). I loved ‘Lost City of Z.’ It was totally outside the NF I usually read – books about books, about writers and writing, etc. – but I was so glad I gave it a try. This one sounds great, too! By the way, WP apparently won’t let me log in with my real, main blog: http://bluestalking.typepad.com What a pain! Alas, my library doesn’t have it. 😦 I really want to find out more about that Sherlock scholar’s murder, though. I listened to this one on an audio book and thought it was really enjoyable. Oddly enough, I think my favorite was the one about NYC’s water system.